In this tutorial we are going discuss about how to create a Front End Component in Joomla. Here I will explain how to create a component and how to display in the browser. Create a folder for your component in Joomla components directory. Here "com_mycomponent" is our new component name. 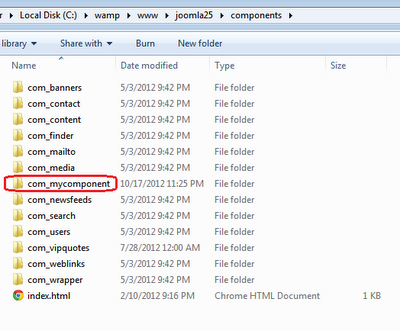 Create a file "mycomponent.php" inside the "com_mycomponent" folder. Write the following code in the "mycomponent.php" file. In my next post, I will explain about how to create our own Back End Component in joomla. Joomla is popular CMS among all CMS Platforms. Hire a Joomla Programmer for custom Joomla development in affordable cost. We have dedicated team for Joomla development. This reminded me when I first started with Joomla development, in back-end this is almost the same, no need to use the class, just echo will do the job. What a small TUT !!! i used Joomla 3.2.1 latest version. I follow you instruction about create component but i not success. why? i think it's error because i did not installing component, right? Screenshots are very helpful to know the concept clearly. 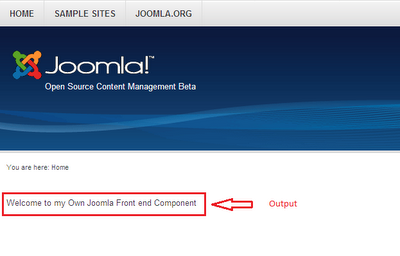 now i understand how to create front end component in joomla. Nice blog.You have given very helpful information. Am really proud of you.